Highlander is redesigned for 2014 with more flowing lines and available 8-passenger seating. 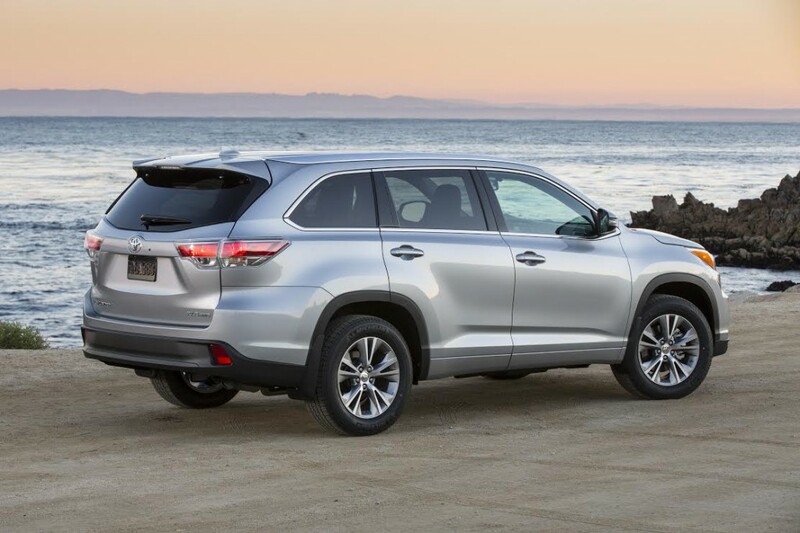 Toyota’s Highlander was introduced in 2001 as one of the first “crossover” midsize SUVs. Built on an automotive-type unibody platform rather than being of truck-based body-on-frame construction, it set new standards for car-like composure for the class. Although it started life as a 5-passenger vehicle, it gained an optional 3rd row for 2004 that raised capacity to seven, and added a hybrid version the following year. A redesign for 2008 left Highlander a half-size larger, but it remained a 7-passenger vehicle offered in gas and hybrid form. By this time, many other midsize SUVs had gone the crossover route, so it no longer stood out for its car-like behavior. Nonetheless, it proved a very popular vehicle that remained a benchmark for the class. 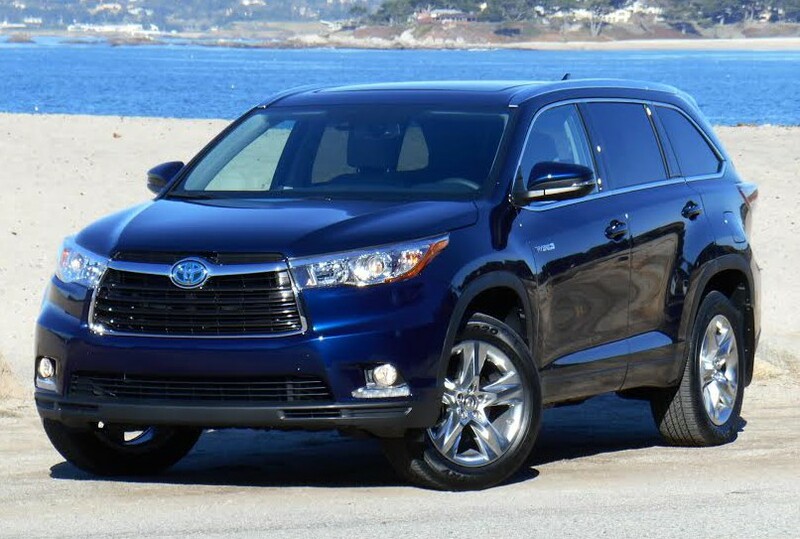 Unlike some redesigns, the 2014 Highlander (right) carries over none of the previous generation’s styling themes. For 2014, Highlander is being redesigned again. Due to go on sale early in 2014, it again comes in gas and hybrid versions, but gains about three inches in length and now offers seating for up to eight passengers. It also adds some new standard and available features that bring it fully up-to-date. To the first, the new Highlander was given swoopier lines and a more stylish “face,” moving it about 180-degrees from the stout, boxy look of its predecessor. 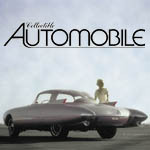 Many redesigned vehicles attempt to maintain a strong visual link to their forebears. This isn’t one of them. Powertrains changed only slightly (the V6 trades its 5-speed automatic for the same 6-speed automatic previously used in the 4-cylinder model), and that’s actually good. Even the base 185-horsepower 2.7-liter 4-cylinder engine, which is offered only with front-wheel drive, feels strong enough – at least with a light load – though highway passing power is meager. The V6 is plenty powerful. With both, the automatic transmission kicks down quickly for more passing power. The Hybrid model returns for 2014, boasting a 28 mpg combined EPA rating. Most of the change in driving dynamics, therefore, relate to chassis refinement. A 2013 model was made available for comparison, and in truth, it didn’t feel that much different in normal on-road behavior. Not that that’s a bad thing. Both the old and new versions ride well and handle competently, which is about par for the course among midsize crossovers. Base 2014 models come with 18-inch tires, which provide a slightly softer ride than the available 19s, but with a commensurate loss in steering precision. Where a difference was noticed between old and new was in quietness. Driven back-to-back, the new model seemed to have a bit less road and wind noise, the latter evident mostly in a slight whistle from the outside rearview mirror. Furthermore, the new model’s V6 engine seemed a bit quieter and more refined, producing only a rich, muted growl when pressed. Toyota’s 3.5-liter V6 has long been one of our favorite engines, and it only cemented its reputation here. The 4-cylinder engine is somewhat coarser and noisier, but it is still fairly refined for a four. Then there’s “Family focused.” The previous Highlander came standard with a 3rd-row seat, but it carried only two passengers for a total of seven. Thanks to an increase in size and a redesigned rear suspension, the 2014 model seats three passengers in the 3rd row for a maximum of eight. Note, however, that the top-line Limited and the Hybrid only seat seven, as they come with two bucket seats in the 2nd row instead of a 3-person bench. Even the base LE has independent climate controls for the 2nd and 3rd rows, with higher trim levels getting automatic climate controls. Heated 2nd-row seats are added on the top-line Limited. A lower dash tray is an unusual storage solution that works as a handy place to stow small items. Another benefit of the aforementioned changes is an increase in cargo space behind the 3rd-row seat. It goes from 10.3 cubic feet to 13.8, which can really be helpful when loading a family’s worth of groceries. 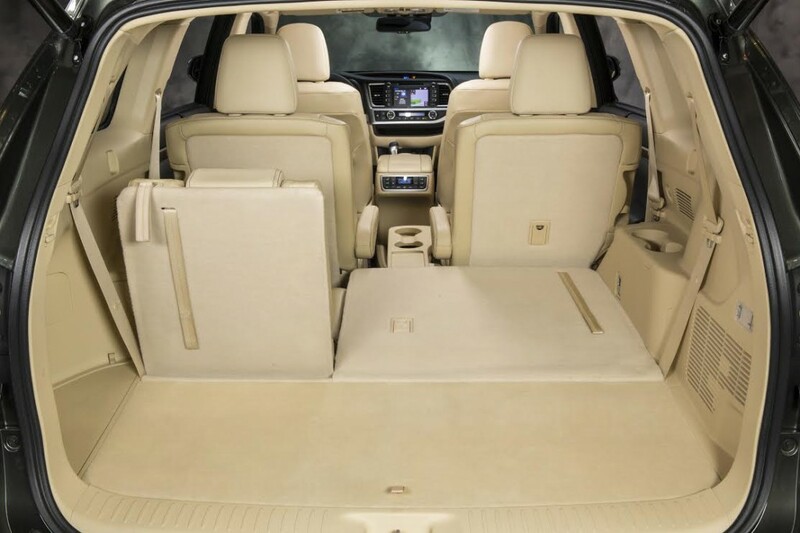 The cargo floor is also 6 inches longer, and the rear seat backs fold flat and level with the cargo floor. Retained is Highlander’s unusual separate-opening rear hatch glass (standard on all but the base LE), which is handier to use than opening the entire liftgate when small packages are to be placed in back. It also allows long items to be carried that otherwise wouldn’t fit. Also standard on all but the base LE is a power liftgate. Two items are offered that make keeping track of rear-seat passengers easier. One is a wide-angle “conversation mirror.” It drops down from the overhead console and allows the front-seaters to see what those in the 2nd and 3rd rows are doing. Newly offered for 2014 on higher trim levels is Toyota’s Driver Easy Speak. With the press of a button, the driver can converse with those in the back rows through the vehicle’s speaker system. Inside, the cabin is fitted with appealing materials in available two-tone color combinations, and many surfaces are padded. Storage is terrific, with a good-size glovebox, a huge two-tiered console box, two cupholders and a forward console bin (the latter with USB/aux/12-volt jacks), a drop-down left-side bin, and a handy (and unusual) mid-level dash tray. All climate controls are within easy reach, but some audio controls are a stretch. Visibility is good to the front corners thanks to thin roof pillars, but the side and rear pillars are thick enough to block some of the aft view. Thankfully, a wide-angle rearview camera is standard. New Highlander boasts added space aft of the third seating row. Note that rear-most seats fold completely flat. Headroom and legroom are ample in the 1st and 2nd rows, the latter aided by seats that slide fore and aft about five inches. Getting in or out of either is easy due to a relatively low step-in height. Both sides of the 2nd-row seat slide forward for fairly easy access to the 3rd row, but no one larger than an average-size adult is likely to fit, and only kids will be comfortable for any distance. 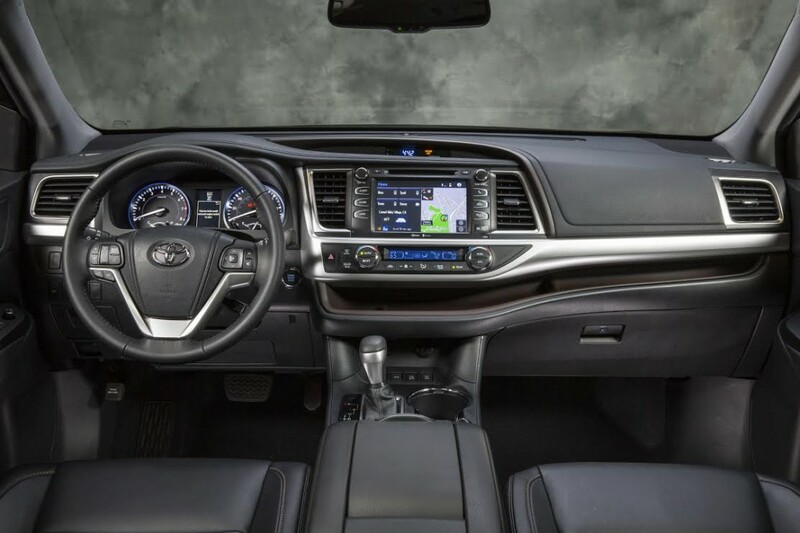 Infotainment systems are expected in today’s vehicles, and the Highlander doesn’t disappoint in this regard. Four versions of Toyota’s Entune Audio system are offered, each tied to different trim levels. The system found in the base LE includes a 6.1-inch touchscreen, aux and USB ports, voice recognition, wireless cell-phone link, and a rearview camera. Added in the LE Plus model are satellite radio and HD traffic and weather info. The XLE gets a larger 8-inch touchscreen, Gracenote music recognition technology, and a navigation system. It also makes available the Entune App Suite, which includes Yelp, iHeart Radio, Pandora, OpenTable, and Bing, and allows for downloadable updates. The top-line Limited has the top-line system, which adds a premium 12-speaker JBL audio system. Fuel economy is a watchword nowadays, and towing capacity is important to many who buy midsize SUVs. The base LE comes only with the 2.7-liter 4-cylinder engine and front-wheel drive, a combination that nets a 20 city/25 highway EPA rating. Towing capacity is 1500 lbs. The 3.5-liter V6 that’s optional on the LE and standard on all other trim levels is rated at 19/25 with front-wheel drive, 18/24 with all-wheel drive. Maximum towing capacity is 2000 lbs, or 5000 lbs with an available towing package. The Hybrid, which comes standard with all-wheel drive, is rated at 27/28, and can tow up to 3500 lbs. Although prices have gone up a bit over 2013 levels, that’s countered by an increase in standard equipment. The base LE starts at just over $30,000 including destination, with the “volume” XLE with AWD coming in at about $38,400. The Hybrid tops the price chart with a starting price just over $48,000, though that’s for a fairly loaded vehicle. Although the new Highlander looks radically different from its predecessor, it maintains its position as one of the top vehicles in the midsize SUV class. And with its added features and functionalities, the Highlander is an even better choice for families, and one that shouldn’t be overlooked. Written by: Rick Cotta on December 17, 2013.on March 22, 2019.